The Committee to Protect Journalists (CPJ), an independent, nonprofit organization that promotes press freedom worldwide, which claims to defend the right of journalists to report the news without fear of reprisal, has accused the authorities in Jammu & Kashmir (J&K) of “falsely” implicating Kashmiri journalist Aasif Sultan on charges of “promoting militancy”. In a letter to Governor Satya Pal Malik to drop all legal proceedings and set him free immediately, CPJ, which is made up of about 40 experts around the world, with headquarters in New York City and offices in a dozen other countries, has said, “His editor and family have credibly disputed these claims and say his work was strictly that of a journalist gathering news. No chargesheet has been filed.” CPJ has no office in India. Sultan worked as assistant editor with the "Kashmir Narrator" magazine, and was held by J&K Police on August 27 last year and a First Information Report was filed under the Unlawful Activities (Prevention) Act, described by civil society a draconian law, following a gunfight in Batamaloo on August 12. Cops picked him up after a cover story by the magazine on Burhan Wani, included interviews with overground workers of militant outfits. Sultan was asked, among other things, to reveal his sources of the story and why he had not instead reported on the government-backed developmental activities in the state. The arrest came even as India continued to slip in the World Press Freedom Index -- it was ranked 138 in 2018 as against 136 a year earlier, one spot below Myanmar and one spot above Pakistan. 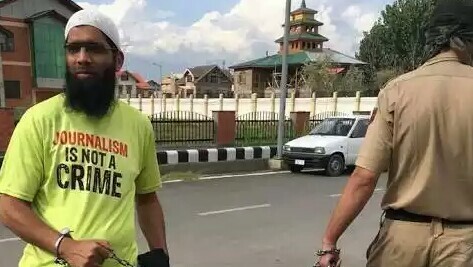 A year earlier, in September 2017, another journalist, Kamran Yusuf, was arrested for allegedly encouraging stone pelting and mobilising people to pelt stones on security personnel. He was, however, granted bail after the police failed to produce evidence against him. Recalling the murder of Shujaat Bukhari, founding editor, "Rising Kashmir", on June 14, 2018, Steven Butler, the Asia Program Coordinator, CPJ, who has written to the Gujarat governor, has sent a copy of the letter to Union home minister Rajnath Singh. Sultan, a journalist with the "Kashmir Narrator", has been falsely accused under the Unlawful Activities (Prevention) Act. His name was included in a First Information Report filed after a gunfight in Batamaloo on August 12, and he has been accused of having contact with and promoting militants. His editor and family have credibly disputed these claims and say his work was strictly that of a journalist gathering news. No charge sheet has been filed. In July 2018, Sultan wrote a cover story for the "Kashmir Narrator" on militant Burhan Wani, which included interviews with non-combatant members of Hizbul Mujahideen. Police have reportedly subjected Sultan to repeated interrogation during his detention regarding the article, asking him to reveal his sources and why he reported on the conflict in Kashmir, as well as questions on headlines that appeared in the "Kashmir Narrator" and why he had not reported on development in the state. Police have also objected in court to his Facebook postings.